Differential Oil Cooler Kit for R35 GT-R is released now. High performance vehicle R35 GT-R's differential oil temperature tends to be very high under severe conditions such as circuit driving. High differential oil temperature may affect on the lubricant performance and/or LSD's performance maintenance. HKS Diff Oil Cooler Kit was developed to solve these problems. HKS Diff Oil Cooler can maintain the differential oil temperature and prevent the oil degradation. Core's installation position is inside the rear under cover. With a special air duct, it can let air into the core and cool it efficiently. 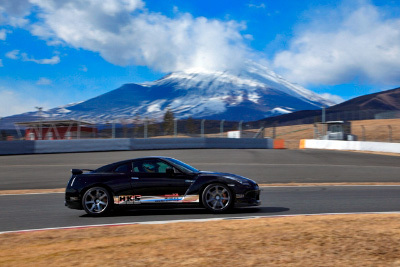 * In-house test was conducted in Fuji International Speedway. The test result showed that the differential oil temperature was dropped approximately by 37℃. The result also showed that the DCT oil temperature dropped approximately by 5℃, and coolant temperature approximately by 3℃. (NOTE) The data above were based on the in-house test results. The results may vary depending on the driving conditions and/or vehicle's specifications. 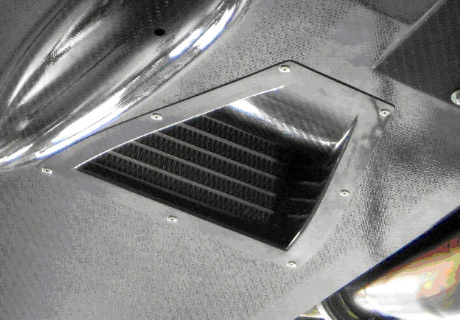 This air duct is to optimize the core's performance. CFRP was used to match with the factory rear under cover. A flat type torques bolt was chosen for better appearance. The layout was designed not to come in contact with any other vehicle and maintain the cooling performance. 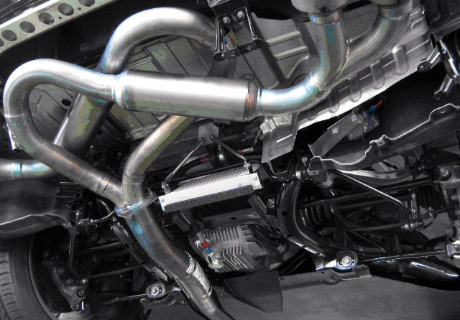 Highly durable AQP Racing Hoses were chosen for piping.